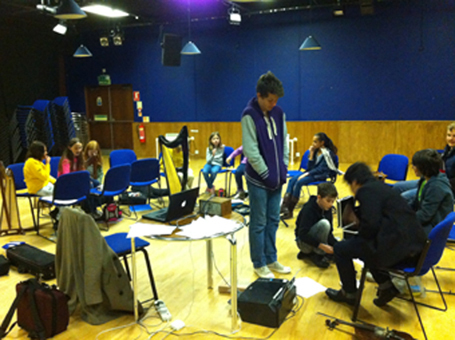 Pupils from the Gael Folk academy rehearsed this weekend for their upcoming show at the Newbury Corn Exchange on May 24th. As part of a project supported by West Berkshire Council and Arts Council England. Following two days of rehearsals at New Greenham Arts Centre parents were invited to attend an informal concert and taster of the music that will be performed with professional folk musicians from Wales, England and Scotland, music students from Berkshire and members of the Southern Sinfonia. Members from the group have been researching local folk music a starting point for this exciting new commissioned work by the Irish composer Anna Rice.